How to calculate your Perathlon scores for the 8 distance events. The 30 and 60 minute events are lower on the page. 1) Select the record 2k time from your ranking division. 3) Select the event factor for the distance you are scoring. 4) Calculate the total seconds for the event you are scoring. How to calculate your scores for the distance events. How to calculate your score for the 30 minute event. How to calculate your score for the 60 minute event. [(362.2 / .8867)(.2199)] / .900 = 1:39.8 would be 900 points. These are some of my times, updated except for 30/60′ events. 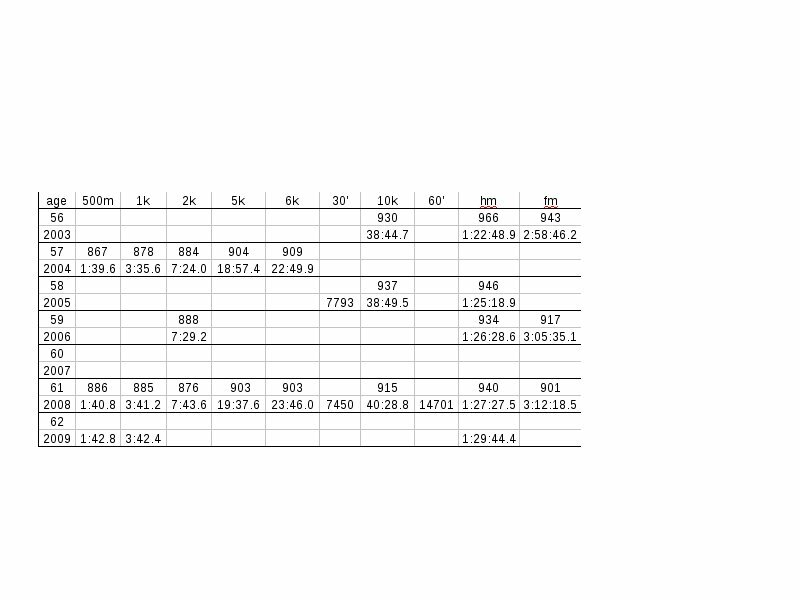 The Perathlon compares Concept2 rowing times for the 10 ranking events, regardless of age, weight class or gender. The latest Perathlon scores are based on exact comparative high placings in the 2008 rankings, and related to current world records for the 2k. The Perathlon has been calculated on a TI-BA2 calculator using learning curve power regression analysis. by signing on to wordpress.com.